PeterPaul solenoid valves and operators have many options. Many of these options are constructed of stainless steel, plated and painted steel. Styles include strain relief connector, single automotive, double automotive, AN connector, splice box, yoke, conduit, grommet, bracket, potted coil & housing. PeterPaul offers an array of seal material options as well coil options. 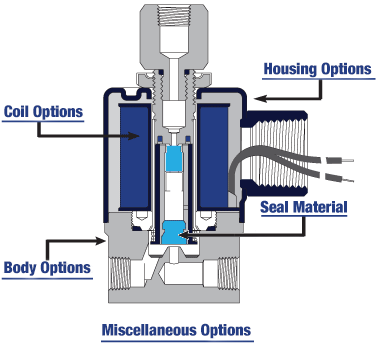 With these options you are able to create a custom valve to soot your specific needs. Our sales department is ready to answer questions and to solve your valve needs. Please feel free to call, chat, email us or click on our Valve Wizard to create a valve that fits your needs.